THE PROBLEMS CAUSED BY PSEUDOMONAS IN HVAC PIPED SERVICES BECAME EVIDENT IN LONDON TWO YEARS AGO - AND THEY ARE SPREADING. As fast as the battle against Pseudomonas is being won in London, so the bacteria is being identified in HVAC systems throughout the country. It was two years ago that Elizabeth Day, a consultant in the cleansing of water systems, and Alan Fenn of FHP Consulting Engineers mage property owners and developers aware of the problems. They are now concerned at the increasing number of cases being found throughout the UK. Elizabeth day said, " Fewer major problems have been reported in Central London, bur Pseudomonas and other similar micro -organisms are being found in significant numbers in other areas". Dean Thomas of Phase Technology says, "Pseudomonas bacteria are now being found in heating and chilled water systems in many parts of the country. Until the last couple of years, bacteria in these types of systems were of little consequence and not often investigated. Now a bacteria known as Pseudomonas has started to appear in the mains water, where it has no significant health concerns, but it can have a major effect on the water system in commercial buildings". This bacteria produces biofilm, or slime. If left to proliferate it can cause severe corrosion and blockages in pipework. Modern buildings with small bore pipework and small orifices associated with control valves are particularly affects. The biofilm will reduce the water flow and provide a habitat for other bacteria that cause corrosion leading to pitting and leaking pipework. 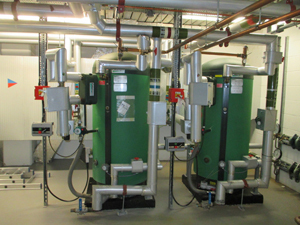 The overall effect in heating and chilled water systems is reduced efficiency and increased downtime and costs of repairing leaks. Mike Darvill, managing Director of Hydrotec tells us, "Historically Pseudomonas has not generally been filtered out of a mains water supply entering a building. Once Pseudomonas is present in a water system, it is difficult to remove and can remain a long-term problem. Dean Thomas agrees, "We have found that the bacteria enter the pipework via the mains, usually as a result of routine maintenance activities. Once Pseudomonas is in the pipework the use of certain corrosion inhibitors can aggravate the problem. The quality of the water used to fill the system should be monitored. Biocide and dispersant should be considered for the initial fill. Dose with Biocide prior to clean. Test the water quality during the cleaning process. Ensure all temporary hoses and pipework as chlorinated prior to use. Consider the type of filtration used on the system. Select Biocides carefully for the best results. Select Corrosion Inhibitors carefully for the best results. Monitor the Microbiological condition on a regular basis. "The biofilm can reduce water flow and provide a habitat for other bacteria that cause corrosion leading to pitting and leaking pipework"
Consultancy and Water Quality Witnessing. We do not sell water treatment chemicals and therefore will give unbiased advice.